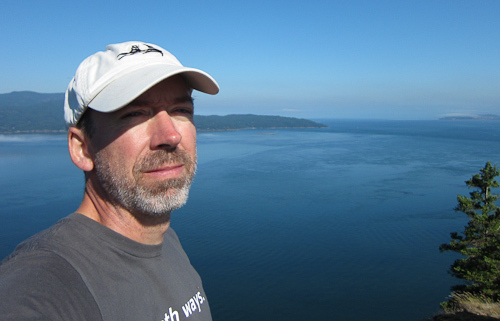 I sailed to Cypress Island for the hiking, and so after waking early, I headed a bit north to Pelican Beach to hike Eagle Cliff. I didn't see any Pelicans, but I did find a free mooring ball to tie to so I could row into shore. On the boat, my dingy serves as my car. It shuttles me from the boat to shore but is also fun to just paddle around with. The dingy can hold two adults fairly comfortably, or three in a pinch. It can haul a lot of kids. Deflated it rolls up quite small and fits in the lazarette (locker in the cockpit). 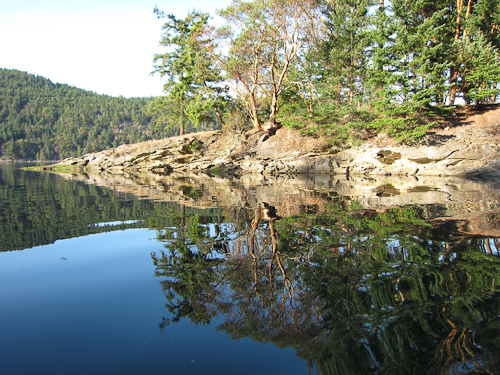 Eagle Cliff is at the top of Cypress Island – about a 3 mile hike from where I came ashore. Hiking through the quiet forest, I saw nobody (this being fairly late in the season). The last part of the hike is a bit of a scramble to the top of Eagle Cliff. The reward is a 180 degree view looking west to the San Juans. I sat in the sun for a while, watching the boats which appeared like small specks on the water. While the power boats seemed to be barely moving, the slower sailboats seemed to be not moving at all. I imagine on an open ocean, a sailboat would also appear to not be moving as it slowly makes its way through the water. An offshore passage from, say, Washington to Hawaii, or Mexico to the Marquesas might take 3-4 weeks. But day after day and night after night the boat moves steadily forward until the goal is achieved. Leaving Cypress Island, I finally found good wind in the passage to the northern San Juan Islands. The sky was blue and the wind brisk out of the northwest. 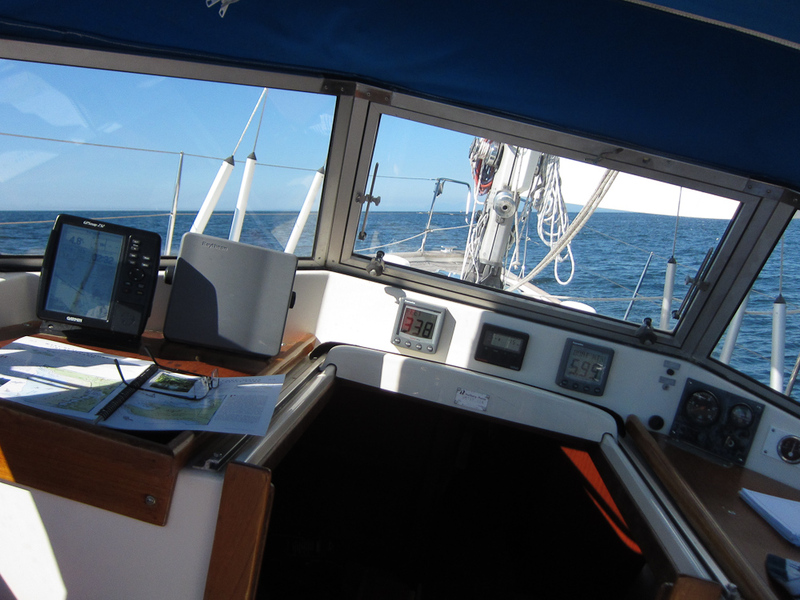 The instruments in this photo show a boat speed of about 6 knots in 15 knots of (apparent) wind. The chart plotter shows 4.8 knots over ground so I was fighting a bit of current. Seaquester is a surprisingly stable boat for 35 feet. She is solidly built and because she has a center cockpit, during the pitching motion of beating to weather, in the cockpit you are like at the center of a teeter-totter with minimal motion. 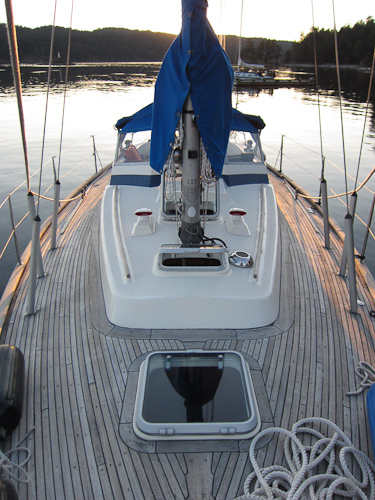 There is some heeling, but again, Seaquester is very solid with fuel and water tanks located below the cabin sole keeping the weight as low as possible, thus giving her a strong righting moment. When it is really stormy, the glass windows allow great vision while protecting the cockpit from flying spray. 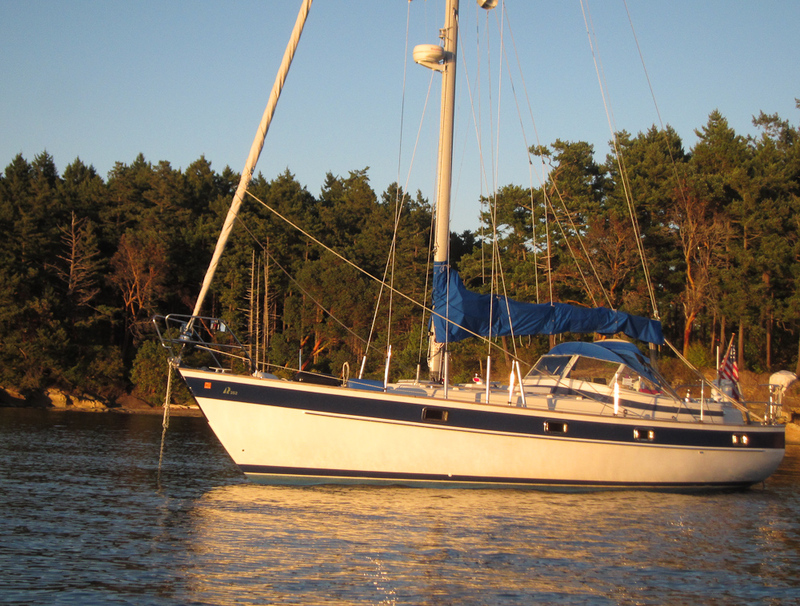 Here is Seaquester at anchor in Shallow Bay on the west side of Succia Island (#4 on the map). Succia is a popular island, even mid-week in the off season. The entire island is a park and you can only get there by boat. The west cove has beautiful sunsets and plenty of room. 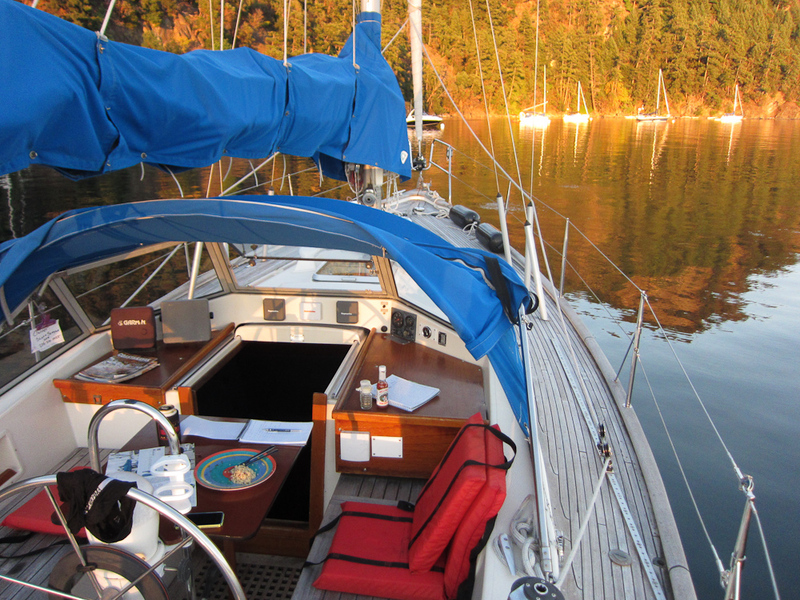 I anchored behind the boats on the mooring balls, then went ashore to hike. Back at the boat I had some snacks then went for a row, which can be as enjoyable as hiking. Watching the sun set, I floated outside the bay into open water. The wind had died and the water was fairly still. 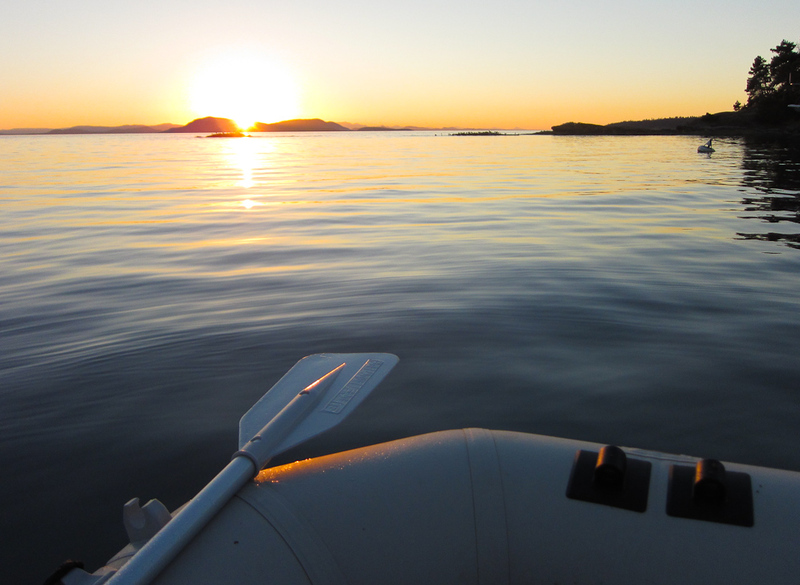 I listened to the birds and the sound of the oars in the water while I watched the sunset behind Vancouver Island. This is a photo that shows Seaquester's foredeck. I have teak decks which are both lovely, and a burden. They are lovely because they are soft to walk on with bare feet and provide great traction when wet or dry. They are a burden because they require regular maintenance and I am way overdue. The teak boards are screwed into the deck with thousands of screws that are capped with a teak bung. Over time, these bungs become loose and fall out requiring replacement. Also, the groves between the teak boards are filled with black caulking that requires replacement as well. I am facing many hours on my hands and knees doing this work or paying thousands of dollars for someone else to do it. Likely this is a project for this winter. 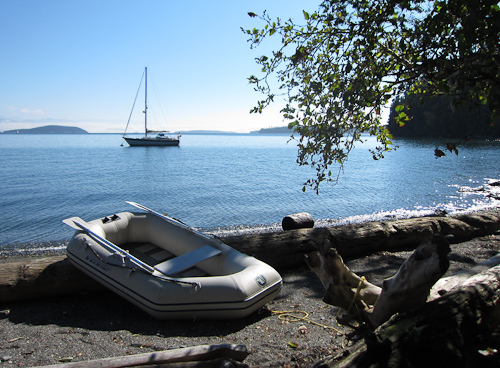 Leaving Succia the next morning, I made for Bedwell Harbor on South Pender Island in the Canadian Gulf Islands. Clearing into Canada is done by tying to the customs dock in selected ports, then picking up a phone which dials direct to Canadian Customs. They ask a few questions (registration number of the boat, who is on board, are there any guns aboard) then say “Welcome to Canada, please write down this clearance number”. Clearing back into the US is a bit more arduous. After I cleared into Canada, I decided to stay in Bedwell Harbor and anchor in Beaumont Marine Park (#5 on the map). There is a hike to the top of Mt Norman that I love to do here (notice the pattern?) and it is a beautiful harbor. That evening I celebrated my return to Canada with a happy hour in the cockpit reading, writing, and playing guitar. 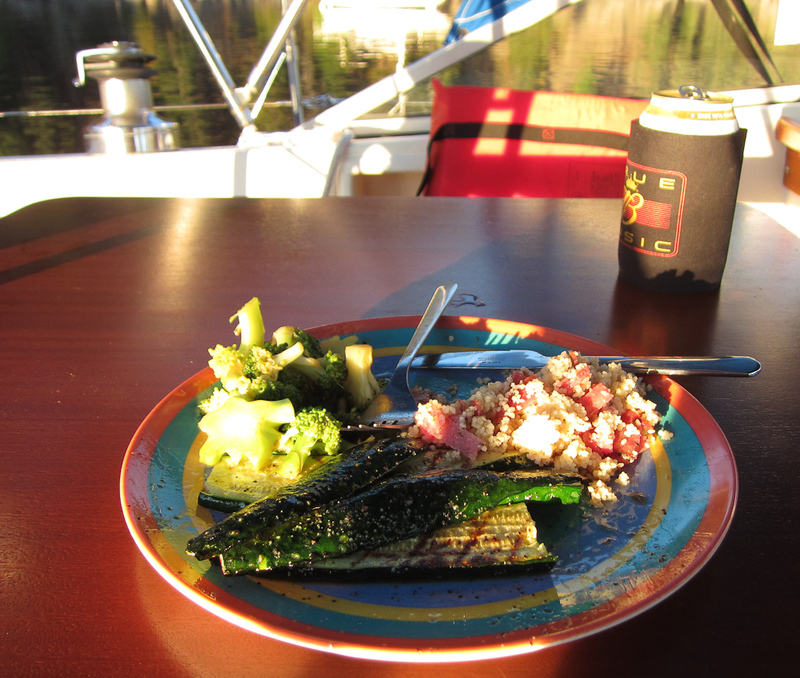 I then cooked dinner and just enjoyed the warmth of the setting sun. Up early the next morning, my goal was to hike to the top of Mt Norman above the anchorage. The trail is fairly long and steep but as you are rewarded at the end with sweeping views of the Gulf Islands. New this year is a pair of binoculars like you find at observation decks on buildings. 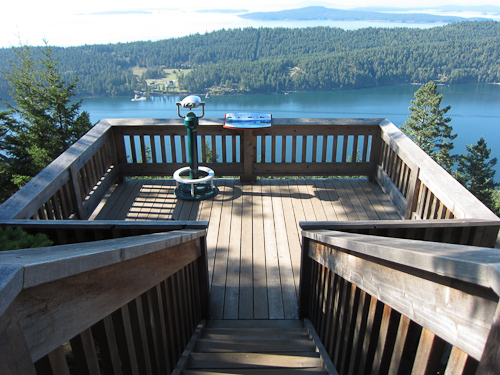 I am not sure who placed it but it is free (no coin needed) and offers excellent views of the southern Gulf Islands. 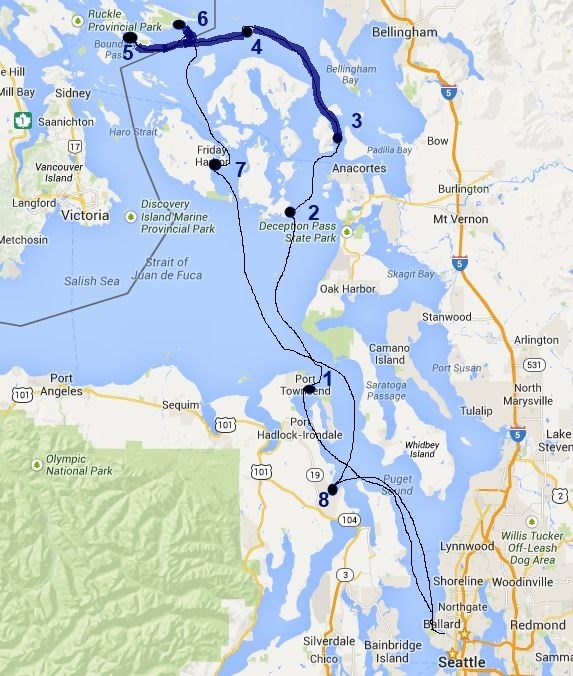 Undecided on where to go next, I was able to observe several of my favorite anchorages and see how crowded they were. 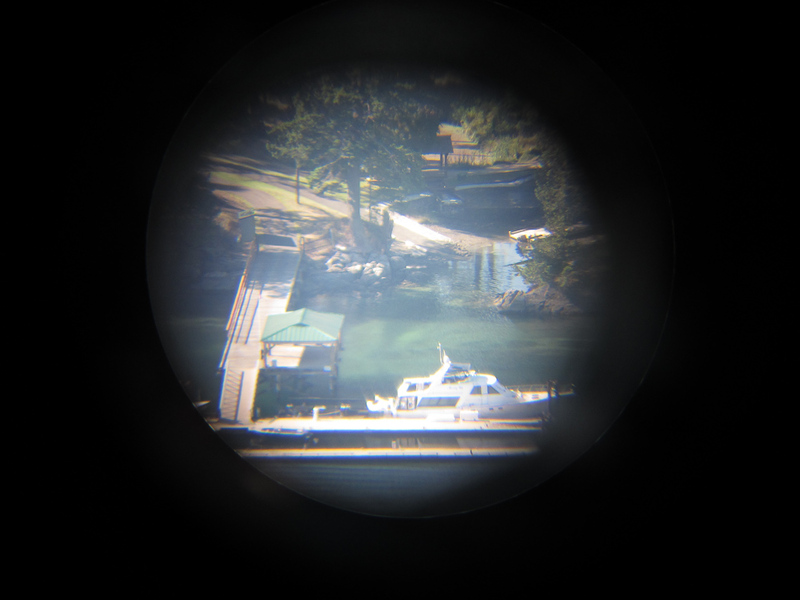 Here is an example of how powerful the binoculars were (view of the boat and dock you can just make out in pic on the right). Hiking down from Mt Norman, I met a kayaker who told me about Narvaez Bay (#6 on the map). I have sailed passed the entrance several times but never ventured in. He said it was secluded, had great hiking (ding), and was rarely visited. It sounded perfect. After a short motor (in no wind) from Bedwell I was at anchor in a bay with no houses and so protected that the surface of the water looked like glass. The hiking was great and at night the silence was so absolute my ears rang. The next morning, I saw some plastic along the shore. With little to do, I decided to do a little trash pickup. 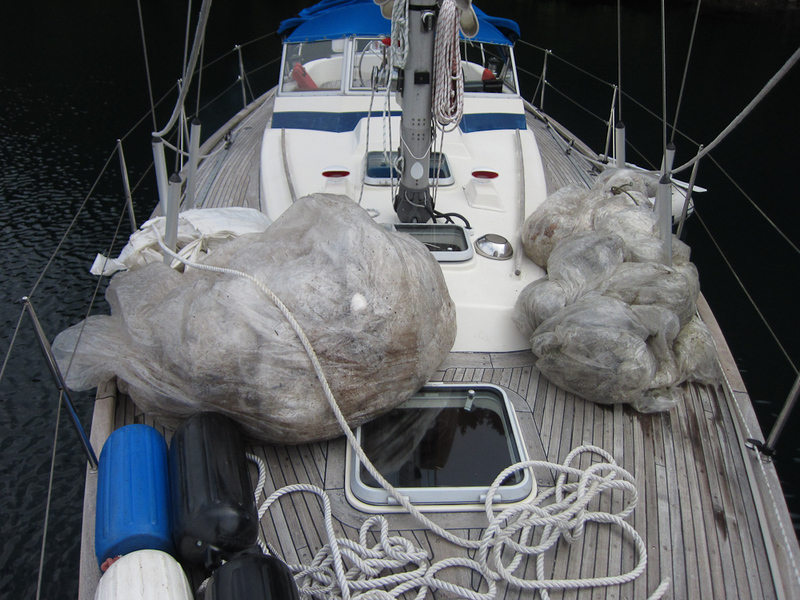 Well, a freighter either jettisoned or lost a large amount of plastic wrapping and it found it’s way into the anchorage. I spent a couple of hours pulling it out of the trees and rocks on the shoreline and had a large amount that I took away for disposal. This was such a beautiful anchorage I was happy to leave it cleaner than I found it.